AN evening of pure delight is promised when The Redditch Orchestra takes to the stage for its latest concert. 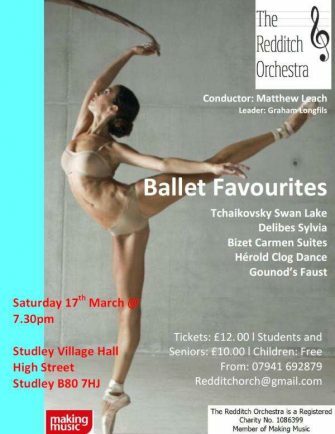 ‘Ballet Music Favourites’ will feature Hérold’s character piece, Clog Dance, from La Fille Mal Gardeé by Frederick Ashton to the lush instrumental sounds and wide emotions captured in Tchaikovsky’s well-loved Swan Lake. Look out too for Gounod’s Faust and the exuberance of Bizet’s Carmen which ensures it is a perennial favourite. The curtain will come down to Delibes’ evocative music from the ballet Sylvia. The orchestra will be led by newly recruited conductor Matthew Leach, a music teacher at Arrow Vale Academy in Redditch. Matthew is originally from Wolverhampton Matt and studied bass trombone at the Royal Welsh College of Music and Drama in Cardiff. He has played with a variety of orchestras as a freelance trombonist including the Welsh National Opera, Concert Orchestra de Cymru, Orchestra of St John, Birmingham Philharmonic Orchestra and the Boulez Ensemble. His performing experience has developed his skills to a level where his conducting embraces his knowledge of all instruments and a large variety of repertoire. This variety encompasses Handel’s Messiah, Haydn’s Creation through to works by Stravinsky and Berio and all in between.